You will probably like this game if you like Arkanoid type games. The aim of the game is to smash as many stone pieces as possible without loosing the ball. The game can be played alone or against up to two computer players. Points are arwarded for each destroyed stone piece. 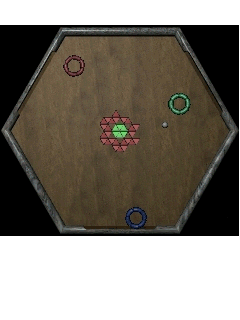 Hexatrolic is derived from Arkanoid type games. It speciality is that more than one player can play the ball. This is a nice idea. However, the game lacks clearly the variety and fun of some good Arkanoid games. Furthermore, the very small graphics, especially the balls make it very difficult to play and handle. The lack of variety and special options compared to some advanced Arkanoid games prevent playing this game very often.